We’ve received a lot of email over the last few months about our long neglected website and podcast. Among other things, the audio files would no longer play. It turns out that was one of many other bigger problems with the site. It’s taken some time and there’s still more work to be done, however, I’m happy to report the site, audio files and feed are back in working order. Over the next few weeks, I’ll continue to repair the site, add comments that were trapped in moderation limbo and fix an array of bizarre characters that appear in the posts and comments. I’d be grateful if you could alert us to any problems you find with the site — things such as broken links, missing photos, bizarre characters, etc… Please leave a comment on this post (since you’re already here) and I’ll add it to the list and keep you posted. Thanks, again, for your continued enthusiasm for our site and amazing children’s books. Some new video content is on its way. We’ve launched the website WeCanRebuildHer.com to document our journey to making Andrea a breast cancer survivor. The site will feature our views as the patient and supporter and carries the tagline Better than she was before… better, stronger, happier. A Breast Cancer Journal. Besides being therapeutic for us, we hope the site proves to be a valuable resource for others who are affected by cancer. Our first post is now live. 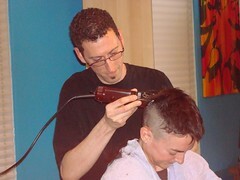 It features audio from Andrea’s head shaving party which took place at our place on Sunday night. Twenty of our friends joined us for munchies, drinks, cake and to show support as we shaved Andrea’s head. We plan to post some video today or tomorrow. Watch for us to blog and podcast our road-to-survivorship experiences and thoughts regularly at WeCanRebuildHer.com. We just received an email from Richard Michelson with a link to a video taken November 8 at the 20th Annual Children’s Illustration Show at his gallery. The video features an incredible gathering of authors and illustrators sending get well soon wishes to Andrea. How cool is that?! Thank you to everyone for participating and to Richard for organizing this. Front Row: Heidi Stemple, Rebecca Guay, Jane Dyer, Jeanne Birdsall, Diane deGroat, Barbara Diamond Goldin, Nonny Hogrogian, Susan Yard Harris. Second Row: Brooke Dyer, Shelley Rotner, Norton Juster, Jane Yolen, Lesléa Newman, Brian Karas, Barry Moser, Susan Pearson, Anna Alter, Alice Schertle. Third Row: Wendell Minor, Jeff Mack, Rich Michelson, Kathy Brown, Nancy Sippel Carpenter, Jeannine Atkins, David Kherdian. Back Row: Carol Weiss, Mo Willems, Scott Fischer, Jarrett J. Krosoczka, Mordicai Gerstein, Paul Jacobs. The Just One More Book!! children’s book podcast will be taking an indefinite hiatus so that Andrea and I can focus on making Andrea a Breast Cancer survivor. We received the results of Andrea’s biopsy, yesterday. This morning we met with a surgeon and discussed the treatment process. Note that before we stop production we still have two interviews and four audio essays to publish. We also plan to do a “so long for now” show. If you’d like to be a part of that show, please leave a short comment on our voice feedback line, 206-350-6487 (UPDATE: our feedback line is no longer in service). We’ll include as many comments as is practical and reserve the right to edit any comments. We don’t know when we’ll publish the show so get your comments in quickly! 1,362,954: total downloads in the last 18 months; an average of 2100 downloads per day (more than 2 million downloads since we launched in July 2006). Thank you for being a part of our community and helping to promote great children’s books, the people behind them and a love of reading. Best wishes and live strong! 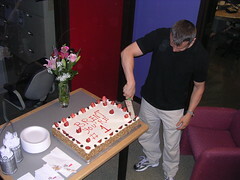 It’s Poetry Friday and, since I’ve been pushed beyond my limits by members of the book industry’s dark side, we present a poem I wrote back in the spring of 2005 to lament the loss of CBC Ottawa’s much loved afternoon host, Brent Bambury. I’ve loved doing Just One More Book!! and it will be sad to turn my back on it. While I’m reflecting on the future of what has been a huge part of our family, every single day for more than three years, I thought it was appropriate to share this era-ending poem (read by its recipient, Brent Bambury). A Capital Lament — by Andrea Ross, May 2005. The Gomery mess couldn’t bug us less — we’re listening to Brent! We’d lost our man, and thus began our Capital Lament. But soon his pace, words, voice and taste led to enravishment. Who know his stint would be a glint? That Go! would lead to went? And we’d be left a town bereft, despite all blandishments. Robert Fontaine, comedien, now who will he torment? Will Lucy sob? Or grab the job? To whom will Laurence vent? We’re sure of this, we’ll sorely miss our host omniloquent. You’re lane to fame is Hog Town‘s gain. Best luck and Thank you, Brent. Read Mark’s post about Just One More Book!! as a member of our family: The baby, the bathwater, or both? On February 5, 2007, we published episode 94 of Just One More Book!! It was a chat with Professor Thomas Wartenberg about the often overlooked philosophical concerns of young children, the deep philosophical issues raised by children’s books and the genesis of Philosophy For Children (not to be confused with P4C) â€” an innovative college course which harnesses the power of children’s books to help children learn to think about and discuss issues of philosophy, politics and social justice. This spring, Professor Wartenberg gave us a sneak peek of his new book Big Ideas for Little Kids, an inspiring guide to teaching philosophy through children’s literature, and asked for our opinion. The book is being released tomorrow, August 28. Just One More Book!! is featured in a fantastic article by Suzanne Gardner for Quill & Quire, Canada’s Magazine of Book News and Reviews (see Ottawa Couple Picking Up Book Coverage Slack). Ms. Gardner did an amazing job balancing the highlights and realities of our efforts to promote great children’s books and the people behind them through our blog and podcast, something we do on our own time and with our own money. Welcome to readers of Quill & Quire. We hope you’ll take a moment to leave a voice mail message introducing yourself and telling us about one of your favourite children’s books. Our community hotline number is 206-350-6487. Thanks to a generous offer from blogger Bianca Schulze, Andrea had the honour today of guest blogging at The Children’s Book Review. A huge thanks to Bianca for the invitation! It was a true pleasure to have the opportunity to write — rather than gab — about the payoffs for parents who read aloud. How old is too old for reading-aloud? We’d love to hear how reading has benefited your family. Leave us a comment below or, better yet, leave us a voice message on our JOMB listener hotline, +1-206-350-6487, so we can include your audio in our show. We spent the weekend at the inspiring and amazing PAB09 new media conference. We made many new friends, reconnected with longtime friends and had our heads filled with amazing new ideas. The conference opened with award-winning radio producer Jowi Taylor telling the incredible stories behind his Six String Nation guitar project. 6SN, as it is sometimes called, is a guitar made from 64 pieces of Canada including a piece of Maurice “Rocket” Richard’s Stanley Cup Championship ring, wood from Pierre Trudeau’s canoe paddle and a part of the Golden Spruce. This project has become so important that the Canadian Mint has pressed 30,000 commemorative guitar-pick shaped coins. Jowi’s Six String Nation book was released over the weekend. By the time his session was over, the PAB community was rushing to the front of the room for the opportunity to hold the guitar, meet Jowi and participate in an impromptu, community fundraiser. We estimate that the community raised nearly $2000 in less than 30 minutes. We encourage you to become familiar with this project and do what you can to support it! The weekend was filled with incredible sessions about digital legacies, storytelling, creative workflow, audio for the blind, videography, photography, life/work balance, authority and epic awesomeness. There was also a series of five-minute JOLT!s which challenged the community to collaborate and discover a world beyond its comfort zone. PAB is the kind of conference that you continue to attend even after everyone has dragged out their long goodbyes and found themselves back in their normal routines. So, there will be no show, today. We look forward to seeing you at PAB2010 in Ottawa. 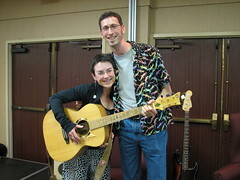 Photos: Andrea and Mark with the Six String Nation guitar taken by John Meadows, PAB09 group photo taken by Bob Goyetche. Seems I missed a great day today at BookCamp Toronto. If you didn’t, and are a Toronto BookCamper who is stopping in for the first time, Welcome! We hope you enjoy your visit to JustOneMoreBook! and that you’ll come back often. You’ll find a post BookCamp Toronto post on Mark’s site tomorrow. BookCamp Toronto: Let the Wild Rumpus Begin! Just look for the tall, handsome guy in the Wild Rumpus shirt! Just One More Book!! is honoured to be mentioned in the Resources section of the recently published The Raising Readers Handbook: inspire your child to be a reader for life. The book, written by Michelle Kadarusman (with Chandra Wohleber, editor), shares book recommendations and activities to help bring books alive for children from preschool through grade six. All proceeds from the sale of the book go to The Raising Readers Literacy Program, a registered charity that supports literacy in early childhood.